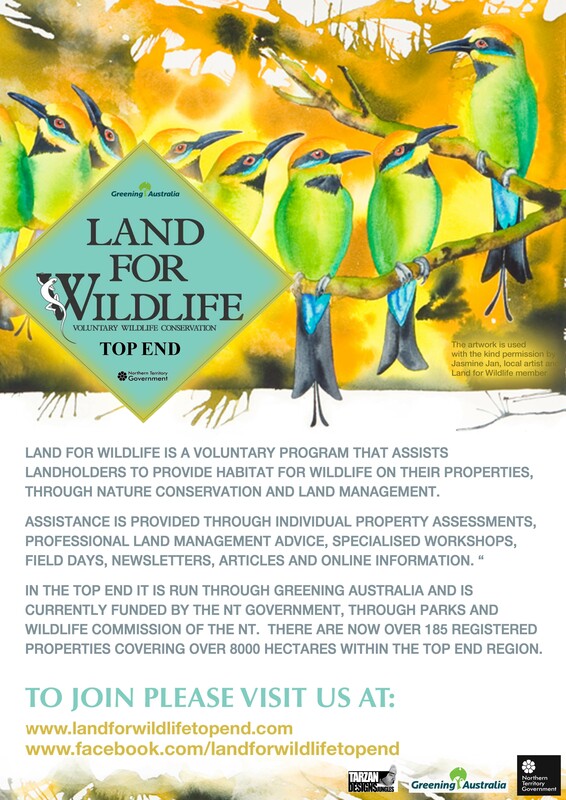 Land for Wildlife is a voluntary conservation program, supporting landholders to provide wildlife habitat through nature conservation and land management and promoting wildlife awareness and education. 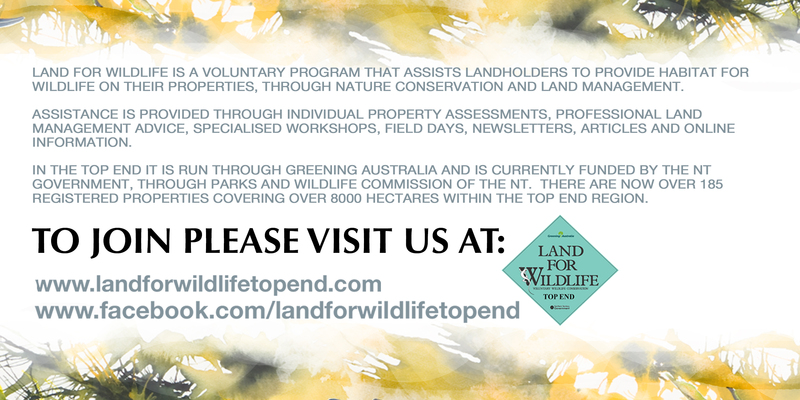 Land for Wildlife operates in several parts of Australia, within different organisations. In the Top End it is run through Greening Australia and its core operations are currently funded by the NT Government, through Parks and Wildlife Commission of the NT. There are now over 200 registered properties covering over 8000 hectares within the Top End region. Properties within the current programme are mainly residential rural blocks within the Darwin rural area, with others near Adelaide River, Bynoe Harbour and further out. 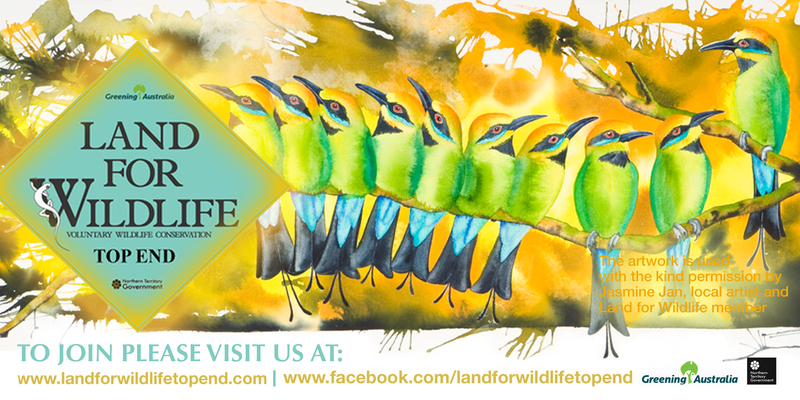 The program also covers some conservation reserves, defence land and Darwin Airport land. The scheme now includes many land unit types, including woodland communities, riverine landscapes, lagoons, sand sheet, coastal vine thicket and monsoon rainforest. Access to support and advice with regards to habitat management, protection and restoration of land, including fire and weed management, feral animals and working with neighbouring properties. Opportunities to be involved in field days, workshops and other activities for capacity building. Workshops and field days are held 2-3 times a year and are held on members’ land. These have included Native Plant Propagation workshops, Fire Management, Weed Management and identification days, “Trees for Wildlife” (an arboriculture workshop about encouraging wildlife by utilizing dead trees/ logs) Field days about local wildlife or landscapes of interest are also held. The scheme networks and promotes wildlife awareness with other organisations with similar values, such as Wildcare and Landcare groups. We also encourage the involvement and support of interested individuals and work with “Educational members” on public ally accessible land such as in public reserves and schools. The project is becomingly increasingly important as Darwin expands and more bushland becomes fragmented and the future of large tracts of native vegetation lies in the hands of private landholders.